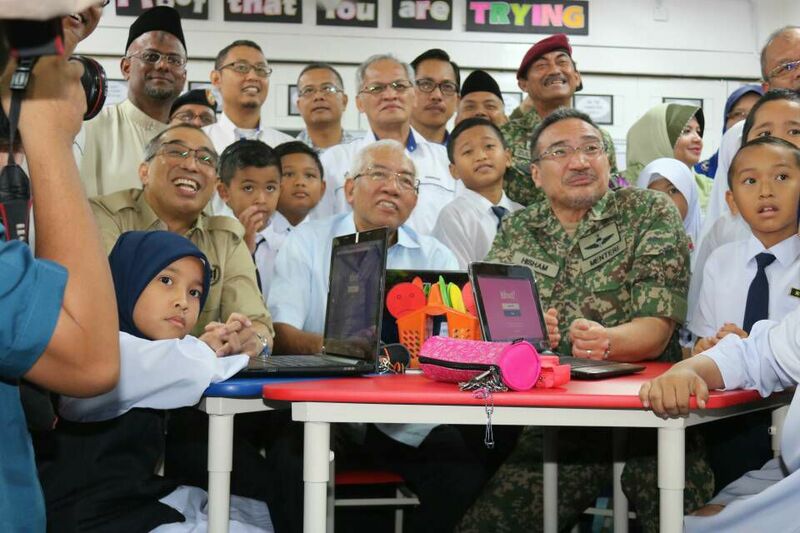 Hishammuddin, Mahdzir and Salleh at the MINDEF Education Blueprint launch in Kluang. KLUANG: The Ministry of Defence (MINDEF) Education Blueprint 2018-2022 was launched by the minister, Datuk Seri Hishammuddin Tun Hussein, in line with the government’s commitment to ensure the future and welfare of the Malaysian Armed Forces (MAF), veterans and staffs of the ministry’s families. This includes providing the interest groups with the best facilities and access to the highest quality of education. Hishammuddin said the launching of the education blueprint was very special. with the presence of the Minister of Education Datuk Seri Mahdzir Khalid and Minister of Communications and Multimedia Datuk Seri Dr. Salleh Keruak. “The presence of the two ministers shows that the government through three ministries are giving special focus on the welfare and future education of the MAF, veterans and the ministry’s families. “The cooperation between the ministries, government agencies, private sectors and state government has enabled our mission to reach the targeted groups. “We have tabled our plans transparently and now fulfil the promise and commitment and then move on to a more meaningful level,” Hishammuddin said. Hishammuddin who is also the Minister with Special Functions said that at the MINDEF Education Blueprint2018-2022 launch in conjunction with “Jelajah Perkasa Perwira” at the Marching Field of the 5th Battalion Royal Malay Regiment, here on Thursday. Hishammuddin added the cooperation among others, Ministry of Higher Education, Ministry of Rural and Regional Development and Ministry of Women, Family and Community Development in the National Blue Ocean Strategy are to ensure the impact of the Blueprint existence. Formulated since early last year, the Blueprint was one of the main initiatives under the Welfare Core of the Ministry of Defence and managed by the Education Task Force.